Week two of my new job and I'm loving it. Even though it involves an hour-long commute at wee hours in the morning--hours at which I can almost guarantee no other college senior is awake--I love the feeling of independence it gives me. I also love the fact that I'm making a name for myself in a big corporation. One thing I'm not yet satisfied with is my lunch. I've been telling myself to pack lunch everyday--like the other co-ops do--but I've only achieved it once. Instead, I find myself purchasing a meal from the cafeteria everyday. This needs to change. The problem is that I rarely crave the previous night's dinner for lunch, so unless I decide to cook/prepare two meals, I'm doomed. I've yet to mastermind a plan that will render me a home-cooked lunch at work, but I'm open to suggestions. So if you have any, please--and I mean please!--contact me. Anyways, in terms of dinner, here's what I made on Sunday. First let me say that I'm not the biggest fan of chicken, but sometimes I can't turn it down. This recipe is as simple as it gets, but it delivers a moist and tasty chicken breast that can be paired with almost any side. 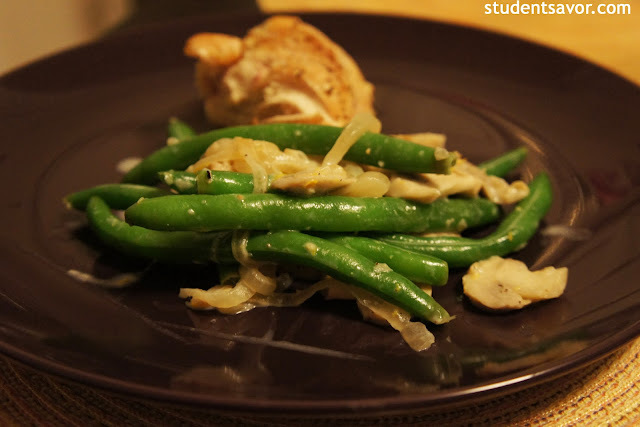 The recipe I used as inspiration called for mushrooms and string beans, but I would bet any vegetable or legume would compliment this chicken dinner nicely. Active time: 30 minutes. Total time: 35 minutes. Heat oven to 400 F. Fill a large bowl with ice water and set aside. Bring a large pot of water to a boil; add green beans and cook until just tender, about 3 to 4 minutes. Transfer to the ice water and let cool; drain and set aside. Meanwhile, heat 1 tablespoon oil in a large skillet over medium-high heat. Season chicken with salt and pepper and cook until golden brown, about 2 minutes per side. 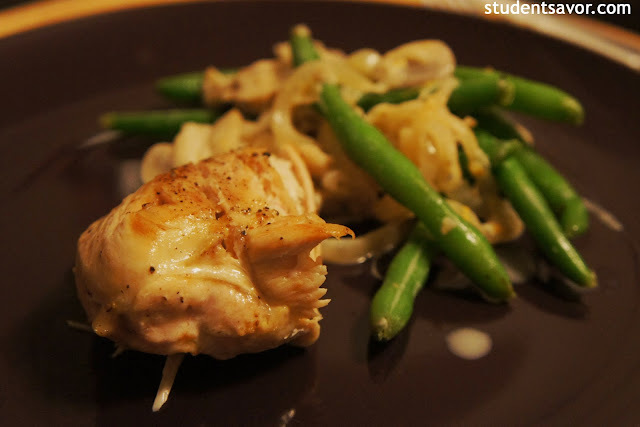 Transfer chicken to a rimmed baking sheet sprayed with cooking oil and place in the oven. Roast until cooked through, 4 to 6 minutes. Wipe the skillet and heat 1 tablespoon oil over medium heat. Add the onion and cook, stirring occasionally, for 4 minutes. Add the mushrooms, shallots, and remaining tablespoon oil and increase the heat to medium-high; cook, tossing, until vegetables are tender, about 4 minutes. 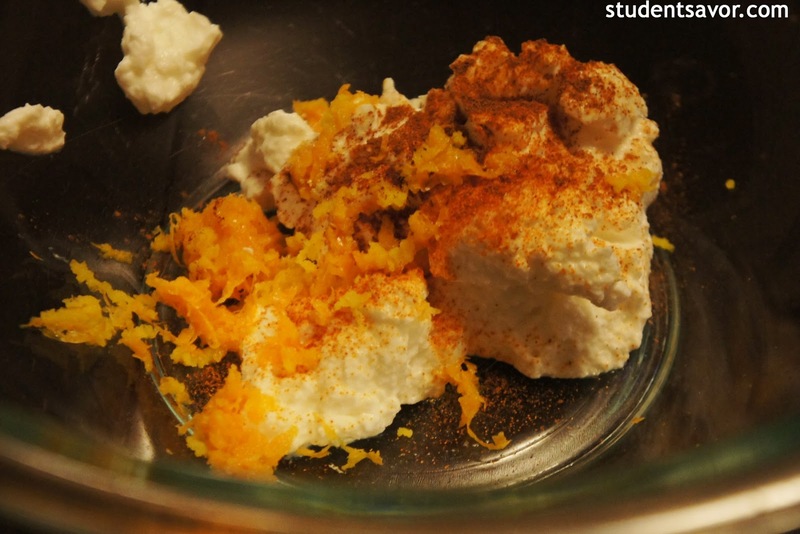 In a bowl, whisk together yogurt, paprika, cinnamon, 1/4 teaspoon pepper, and 1 tablespoon water. Add to the mushroom mixture and toss to combine. Fold in the beans and zest and cook until heated through, about 2 minutes. Serve with the chicken.